Found these this morning on the Martha Stewart website! Yummy!! 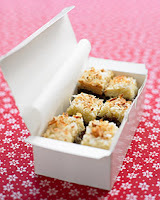 I love coconut and with a brownie style bottom it should be perfect! Not sure how this works into my restrictions, I mean resolutions! I would love to squeeze this recipe into today's schedule. Not really sure how to work that and continue to keep the little ones from killing each other. It is only 10 am and they are already restricted to one on each floor. Thank you Lord for three stories! I promise not to complain today about the big house and cleaning it!! One more day and they are all back to school! Happy Birthday to me!! This would be the perfect day for the cook I have always wanted to start working!